Deanna Davis is no stranger to tough times. Like the rest of us, she's faced her share of heartache, self-doubt, and professional obstacles among other challenges. In this inspiring new guide, she mixes together all the best ingredients-good humor, a dollop of wisdom, and powerful insights from the worlds of Positive Psychology and neuroscience-to serve up practical strategies for transforming your life, no matter how warmed-over everything around you (and inside you) might seem. With humor, honesty, and a down-to-earth, relatable style, Davis shares stories and insights that address the issues real women face every day-from balancing family needs with personal and professional ones, and stealing a few moments of quiet every now and then, to getting through the rough patches that every relationship sometimes throws us. Celebrating the importance of mindful living, the power of friendships, and the undeniable benefits of a good laugh (and, every now and then, a good cry), this is just the satisfying read we need for these tough times. Deanna Davis Ph.D. is an accomplished author and professional speaker. She has coached hundreds of clients and spoken before audiences of thousands for over 15 years on mind/body health, peak performance, and Positive Psychology. She has attracted her ideal life with her husband and children in Spokane, Washington. 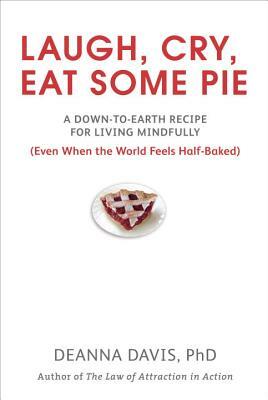 "Laugh, Cry, Eat Some Pie is a delightful book that delivers profound insights about life, laughter, and the pursuit of happiness. Deanna is a masterful storyteller with a knack for translating laughter into lessons for life change. Her resounding message is that happiness isn't determined by what you have, where you are, or what happens to you. Instead, it is cultivated through practicing happiness daily, regardless of what's going on around you. Treat yourself to a generous serving of this outstanding read today." "Deanna Davis has done it AGAIN. With insight, humor and precision she shares and inspires in a way that is practical and memorable. Get two: you'll want to share one with your best friend." "Deanna has created the most delicious blend of up-to-the minute research, tantalizing writing, and a truly juicy message. The whole book made my mouth water but most importantly, it fed my heart." "Using her trademark humor and real life tales, Deanna teaches us how to "create space and possibility" in our lives by committing to laughing fully and living mindfully. Laugh, Cry Eat Some Pie is a recipe for loving yourself-and your "now"-while still looking forward to your next "course" in life. Offered up as an appetizing compilation of stories for us to savor, it's a must read for today's multi-tasking woman."